Select the HP Live Swivel Fitting by Cleasby to ensure extend the life of your spray hoses by preventing unnecessary stress and damage. 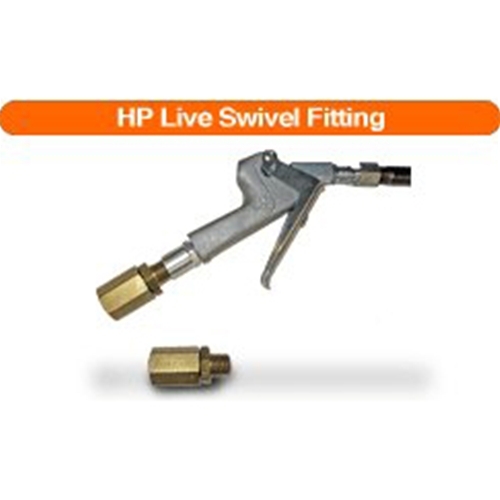 The HP Live Fitting is rated for 300 PSI and rotates up to 360 degrees to make handling easy. Using the HP Swivel fitting eliminates twists and longer range bends that can ultimately lead to damage occurring to your spray hoses. Install the fitting between the spray gun and the fluid hose and hit the ground running! The design of the fitting not only reduces equipment damage now and in the future, but also reduces fatigue for the operator since applications are more comfortable and directional fighting is cut to a minimum. The fitting features joints that are hardened for maximum strength and durability – ensuring that wear and tear is limited and the fitting serves its purpose for the long haul. Cleasby has been providing commercial and residential roofing equipment and accessories for decades, and has withstood the test of time and performance. In an industry where your equipment takes a beating daily, the HP Swivel Fitting is an easy solution to prolonging the use life and maximizing your return on investments. Shop all Cleasby equipment for foam roofing and more. Intech Equipment and Supply has been providing the spray foam and traditional roofing industries with equipment solutions and expert support for two decades. Combined professional experience coupled with practical equipment knowledge and a passion for making commercial and residential roofing a successful, profitable business – Intech provides best in class support and the industry’s best equipment manufacturers. Shop the Intech Equipment Online store for the item you need, or contact our pros to talk through the specific demands or discuss compatibility or custom orders. We are available to assist you in person at our facilities across the US, as well as by phone or online.